Joining the gas buying group enables your business to purchase energy at the best possible rates. Successful applicants will be grouped up with other like-minded British businesses and will have the opportunity to purchase gas in higher volumes, with advantageous economies of scale. Buying groups give all members greater purchasing power and guarantee the very best unit-rates on gas. Business Gas.com will set you up with other businesses and negotiate with suppliers on behalf of the group. All you have to do is register your interest and we will connect you as quickly as possible. There’s no need to interact with other group members, our expert brokers will handle everything on your behalf. To help further reduce your monthly gas bills, we will equip your business with a smart gas meter to help you better manage your consumption and reduce areas of energy wastage. And the more businesses which sign up to the group buying scheme, the cheaper the unit price becomes – so tell your friends. To join our large energy user group you must use over 100,000 kWh of gas. This can be at a single site or spread across multiple sites. You can join our small users group if you use under 100,000 kWh of gas. The potential economies of scale in this group are not as large as in the large user group, but they are still an improvement on individual purchasing options. Joining the group is simple. Just register your interest with one of our expert brokers and we’ll take care of all the hard work. After you’ve signed up for the buying group we’ll arrange for a smart meter to be installed at your premises, free of charge. We also guarantee a full years online daily reporting as well as a bill validation system. This technology will enable you to see how much money you are saving in real time. It will also enable you and your team to better manage the energy consumption leading to further savings on your energy bill. Joining the gas buying group enables you to significantly reduce your monthly energy bills, and the smart metering system means you can say goodbye to estimated bills. The gas buying contracts are all renewed on the 30th of September each year, but we can arrange a short term contract for any period of time leading up to the renewal date. This means there is no need to worry if you have missed out. Below is a fictional illustration showing how different businesses in different industries can save money by joining a gas buying group. If all three of the businesses join the Smart Gas Buying Group alongside other similar UK businesses they will all get cheaper unit rate offers. Want to see what kind of discount your business can achieve? Get in touch today. Call 0208 1503772. 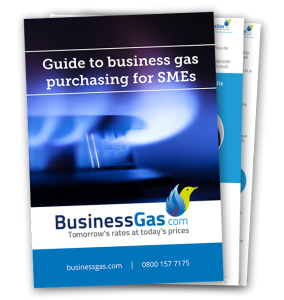 Start saving today with our guide to buying business gas.